42 years ago we made tryst with destiny for our country to come to age, to be free from suppression, to find our own freedom and to take a pledge to stand together as one country, one people and one nation. On this day our first thoughts must first go to the architect of this freedom, the Father of our Nation, our deepest respect to Grand Chief Sir Micheal Somare. It also gives me great pleasure to be standing here as the Governor of our capital city, Port Moresby and to be addressing all of you on this great auspicious day on our 42nd Independence Celebration. Freedom and power brings with it responsibility. 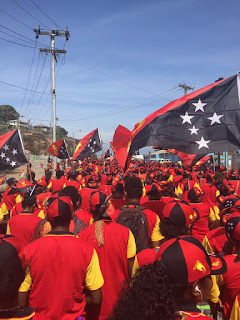 The responsibility rests not only upon this Government, a sovereign body representing the sovereign people of Papua New Guinea but to all of as citizen of this great nation. Before the birth of independence, we have endured all the pains of sacrifice and our hearts are heavy with the memory of some of our fallen angels. Nevertheless the past is over and it is the future that beckons to us now. That future is not one of ease or resting but of incessant striving so that we may fulfil the pledges we have so often taken and the one we shall take today. This pledge is for everybody, no matter who we are and what tribe we represent or which province we come from or which language we speak. Today we are coming together to make a stand. Our pledge signifies to me and hopefully to all us together collectively, that we are one people, one nation and one country waving our national flag with pride and patriotism. We have one destiny! Amidst the doom and gloom that is cowering our nation, we must also commend our great country Papua New Guinea for some great achievements we have accomplished as a 42-year-old vibrant Democratic nation. As any democracy, I must acknowledge our people, for the past 42 years, we have had successful and competitive elections and formation of Government since we got Independence. The recent one is a testament to our thriving democracy despite its many challenges. We also had political freedoms. Despite all the distortions threw at us, we had real political freedoms to move parties without fear of being jailed or killed. This must be acknowledged and celebrated as well. After 42 years of Independence, I call upon our people to support your elected leaders in Government to fulfil its obligations as leaders of our nation. Do not compromise and fall into the delusions of the unelected, thinking they know better and we become our own worse enemy and we will fail ourselves for another 5 years if we continue the blaming, the criticism and not allow and support leaders to do what they are meant to do for the highest of good of our nation. That has to stop. We have to stand together and initiate change from bottom to top and top to bottom. As someone who support women empowerment, I am also saddened after 42-years, we have no women representing us in parliament. As Governor of our Capital City, I have made advancing gender equality and ending gender based violence and all from of violence a priority for our country. And we are in the process of implementing a comprehensive strategy to end gender-based violence around the city and the country, from prevention, to treating survivors, to bringing perpetrators to justice. And through many of our behaviour change programs, including partnerships with International Organisations, we want to remove barriers that prevent women from participating fully in their societies. I am also equally committed to making our city and our country a place of abundance opportunity for our young people with an economy that sustain our nation into the future. I am committed to using the privilege given to me this third time to lift our city and our country into the 21st Century where we can be as good or better than any countries in the world in all aspects. This is a challenge we must embrace and achieve together. We are almost 50 years and we can't continue to give excuses. After 42 years, the future that we must all aspire to build, is that we must be free to live out our dreams. Where our children’s aspirations aren’t segregated by the fact that they are women or girls or a subject for violence. Where working families don’t have to choose between children not going to school because she has to care for an elderly or a child and or earning a salary. Where women and girls, no matter where they live, are free from fear of violence — including sexual violence. Where hatred against women, or hatred against any person or any community, that doesn’t neatly fit into some predetermined notion of how people should be or how they live or what they say. A future where women lead half our businesses, make up half of our parliaments. Where our girls know they can hold any job, and run any company, and compete on any field, and perform on any stage. That’s the future we must aim to build, free of ignorance and disease and inequality of opportunity. We must dream of this possibility. We have hard work ahead. 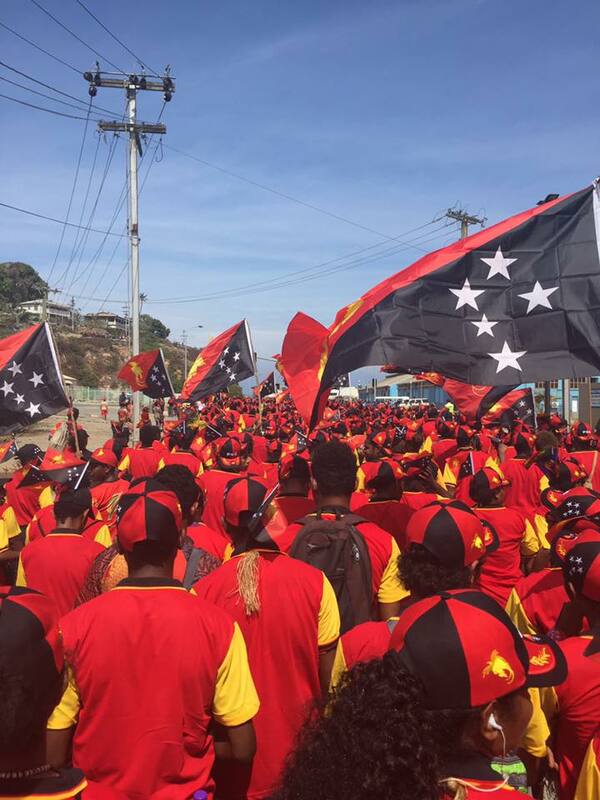 There is no resting for any one of us till we redeem our pledge in full, till we make all the people of Papua New Guinea what destiny intended them to be. We are citizens of a great country with a 1000 tribes and 860 languages with a vibrant culture and diversity. All of us, to whatever tribe we may belong, are equally the children of Papua New Guinea with equal rights, privileges and obligations. We cannot encourage communalism or narrow-mindedness, for no nation can be great whose people are narrow in thought or in action. There is no more time to waste. The time in NOW, The future is in our hands. I am optimistic moving forward as optimistic as I am now. We must dare to bring success, productivity, happiness and opportunity to the common man and women, to bring an end to mental and emotional poverty and ignorance and low mortality; to build up a prosperous, democratic and progressive nation, and to create social, economic and political institutions which will ensure justice and fullness of life to every man and woman. God bless you. God bless Port Moresby and God bless our Country, Papua New Guinea.